After a hard-fought series that went into double overtime, the North American hopefuls Cloud9 have won the Eleague Counter-Strike Boston Major. Cloud9 came into the finals as the underdogs, having bounced back from an 0-2 in an earlier stage of the tournament to climbing the playoff bracket, picking off favorites like SK Gaming in the process. They’re also a North American team, so they were co-opted by the crowd as the “home team.” FaZe Clan, meanwhile, boasts a prime roster and were looking to make history in several ways, including Olof “olofmeister” Kajbjer who was looking for another major win, this time under the FaZe banner. Game 1 started in Cloud9's favor, with Tyler “Skadoodle” Latham frequently coming through as the clutch player for the American team. But the advantage soon swung the other way, as FaZe swung an 8-1 score line back to their side, eventually closing the first map out at 16-14. Game 2 started with another strong lead for Cloud9, and another gradual ceding of that lead. Despite more incredible plays from Latham, Cloud9 managed to get to 15 and then took an extra seven rounds to seal the deal. Cloud9 did eventually win a round to tie it up and send the series to map 3, but not before FaZe had taken a good few rounds off them. Game 3 started with both teams trading momentum—Cloud9 surged out with five rounds, then FaZe responded with a run of their own. Cloud9 started looking a little down, as they continued to dash themselves against the rocks of FaZe, trying to break their spree with what money and equipment they could scrounge. They finally managed to stop the bleeding in round 14, where a slow, steady approach managed to break through. Winning the next round as well, the score came out to 8-7 at the half, still anyone’s tournament to win. Switching sides, FaZe started to see success on the terrorist side, and despite some great individual plays from Cloud9, it seemed like FaZe was in full control of the finals. Back and forth, the rounds inched closer and closer to the 16 needed to win the game. While FaZE finally got to tournament point, the last one seemed like it would take more effort than the 15 that preceded it. All the while, Cloud9 picked round after round off, moving closer to their own tournament point. It came down to round 30, the last possible. FaZe trying to win, Cloud9 trying to tie it up and send the game to OT. The latter came through, and sent the major into overtime. 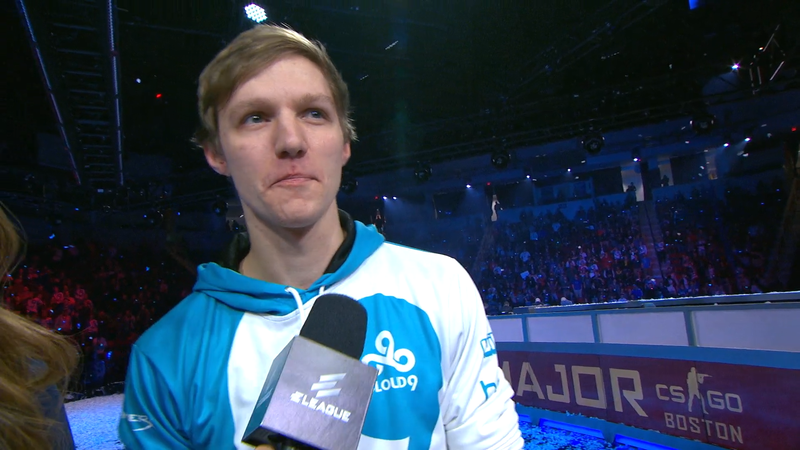 Feeling the energy and roar of the crowd, Cloud9 entered OT looking confident. Three rounds in a row they ran over FaZe, and soon the mood had shifted—rather than fighting for their lives, they were one round from taking the whole damn thing. FaZe managed to weather the storm, holding out against a quick rush and a sudden bomb site switch in the following two rounds. At this point, the major was as much about endurance, concentration, and composition. So many rounds had been played, and on the final round of OT1, it was FaZe’s turn to fight for its life against Cloud9's tournament point. And this time, it was FaZe’s turn to spoil the fun. Second overtime, and these teams seem destined to clash forever, with enough force to wound but not topple. You can start to see the toll this series is taking on the player’s faces. Each round won is an immense high, but each round lost is a desperate low. Cloud9 manages to pull out to a match point, feeding off the tired but enduring chants of “U-S-A, U-S-A.” At OT2, round 5, Cloud9 finally landed the finishing blow. Cloud9 takes home $500,000, the first major of 2018, and a huge underdog win for North America.